Oh, my dearies…you need some color. 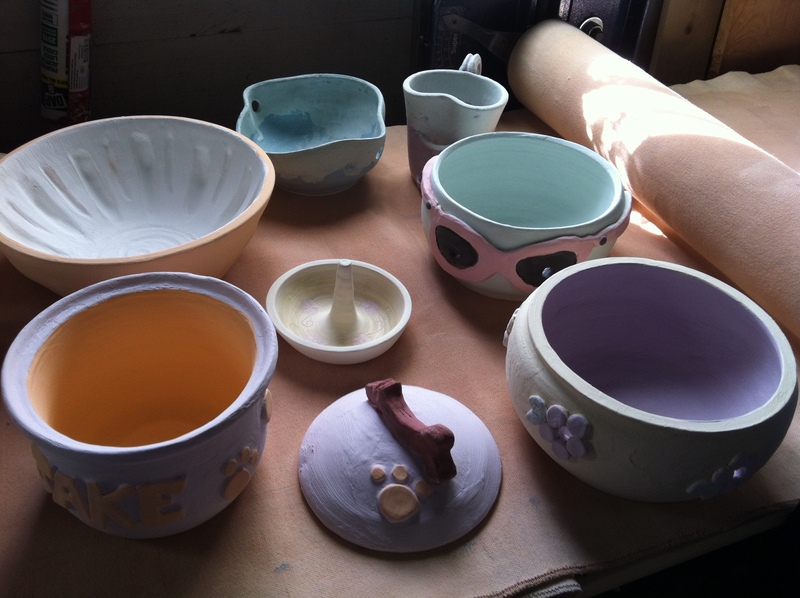 I went on a glazing spree while I was at the front today in the Gallery. 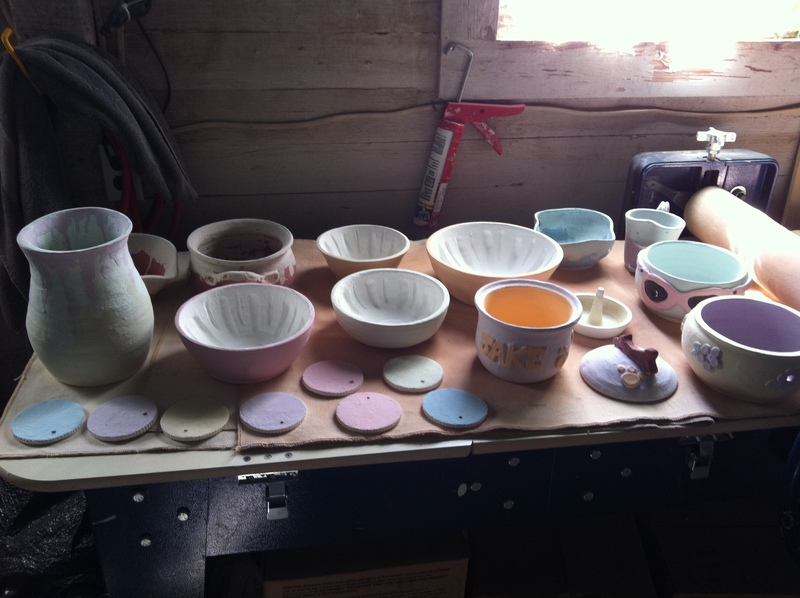 I set up a card table and brought all my bisque fired pieces and went to town! Looking good my little ones!! I’ve also made a large group of coasters. 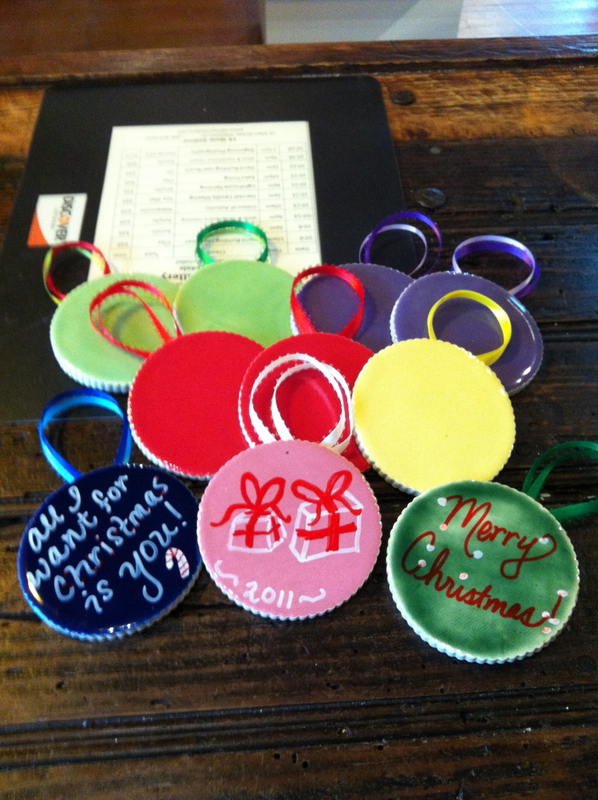 Unfortunately about half of them warped in the firing, so instead of chucking them I decided to turn them into Christmas ornaments that you can customize each year with a dry erase marker. Isn’t that cute? You can change them each year to suit your preference. Thank you Kristy for that idea! Most of the glazed items are in the kiln right now so I’ll take more pictures so you can see the huge disparity between the glazed and glazed that’s been fired. I was completely and utterly flattered, excited, humbled, etc. to get the email for the October newsletter from 16 Main and see my face smiling back at me as the featured artist of the month. Me?! Little ol’ goofy me?! I’ve been doing this for about a year and a half now and I can’t believe how blessed I’ve been. 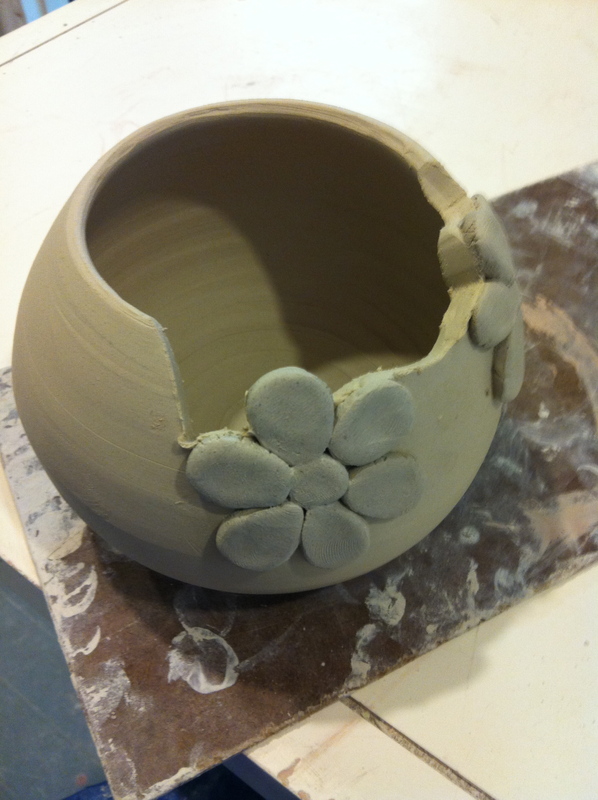 I’ll be glazing tomorrow night so expect some pictures soon! 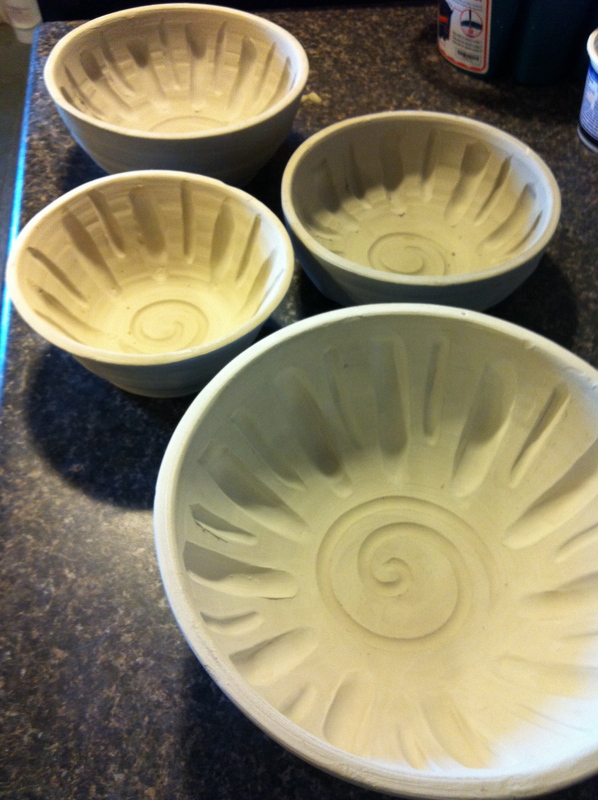 Oh, my pretty soup bowls. Really, you are just the cutest things ever. What? You don’t think so? It’s because of your backside, isn’t it? 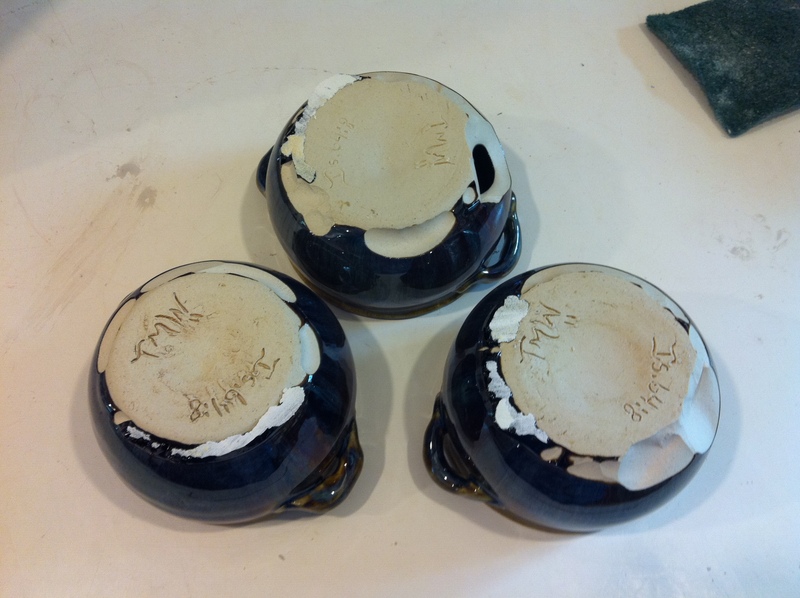 Attachment to the kiln shelf is such a sad thing… These three now lay in the pile of the unmentionable. I blame myself. 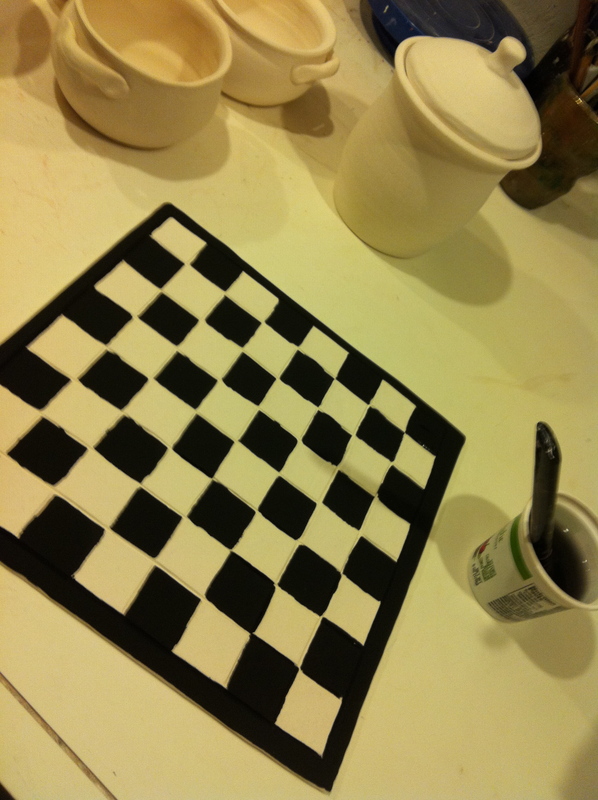 Glaze was thick and I shouldn’t have done two coats. The good thing, however, is that today was a fantastically productive and creative day! 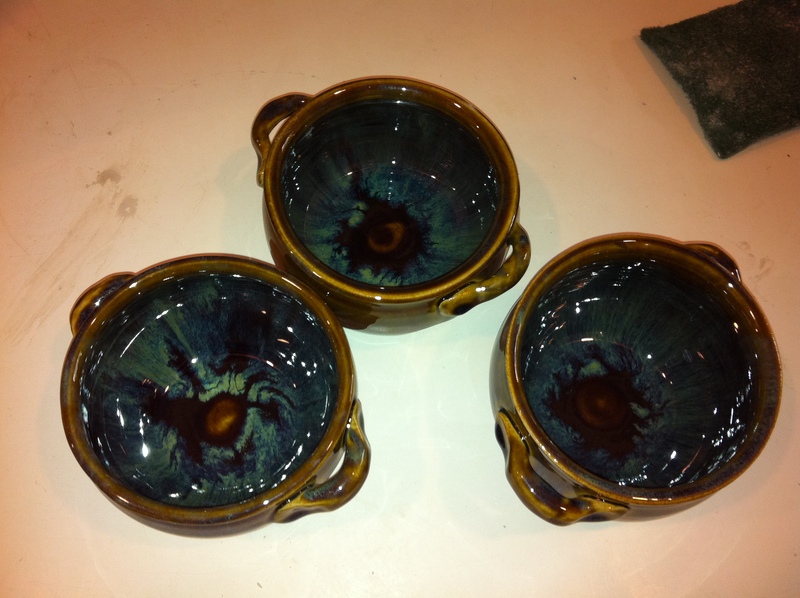 I remade the bowls, but this time with 2 extra ones just in case. 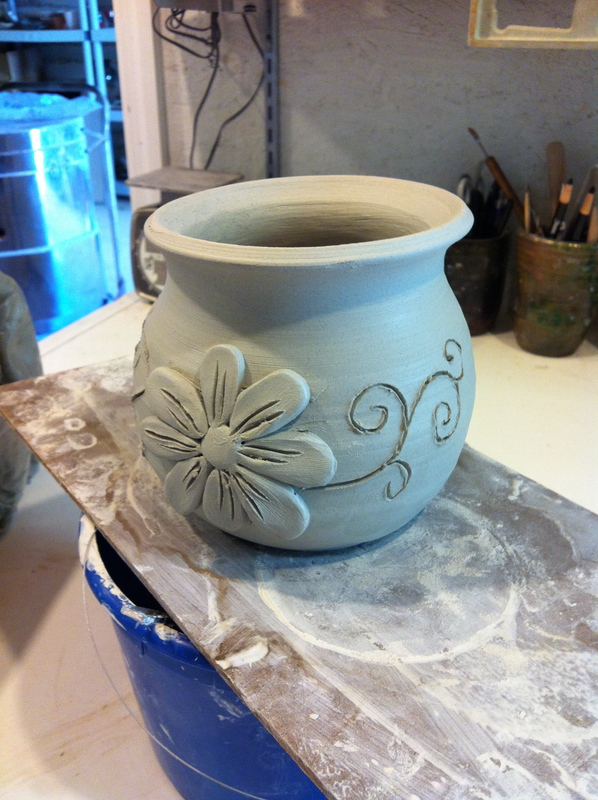 …And ended up with something that I love! I’m crossing my fingers that everything (all petals and centers) makes it through since I can’t wait to set a tea light inside and see the shapes illuminated. That’s what I meant by bipolar. This morning I was so very sad to see those bowls stuck to the shelf, but I ended up making some of the cutest stuff later. 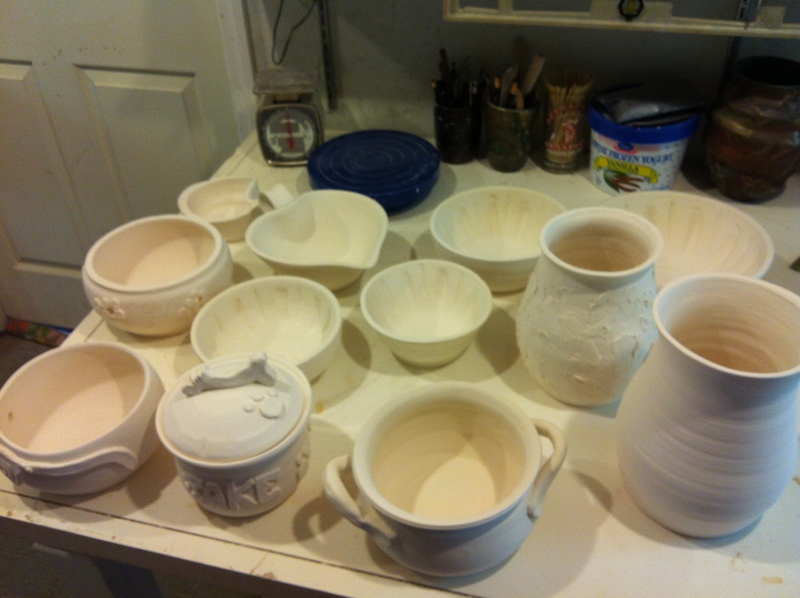 Ned, Martha, and my pieces ready for bisque fire. A past in silence has led to an intense love of music. It’s nearly an obsession. I love it all and I can’t ever (nor do I want to) stop the music I’ve got going in my head. I call it my mental jukebox. Not in a crazy way, but in a can’t-help-myself-I-love-music way. I love the brevity of good lyrics and a melody that can speak for itself. I’ve even been told that if I can be heard humming or singing to myself they know I’m in a good mood. I could honestly speak in lyrics, and that’s where this leads. Also, I can’t ever write one of these things without a song playing. I forgot to share the bowl with the swirl in the bottom. During the street festival I made three more. 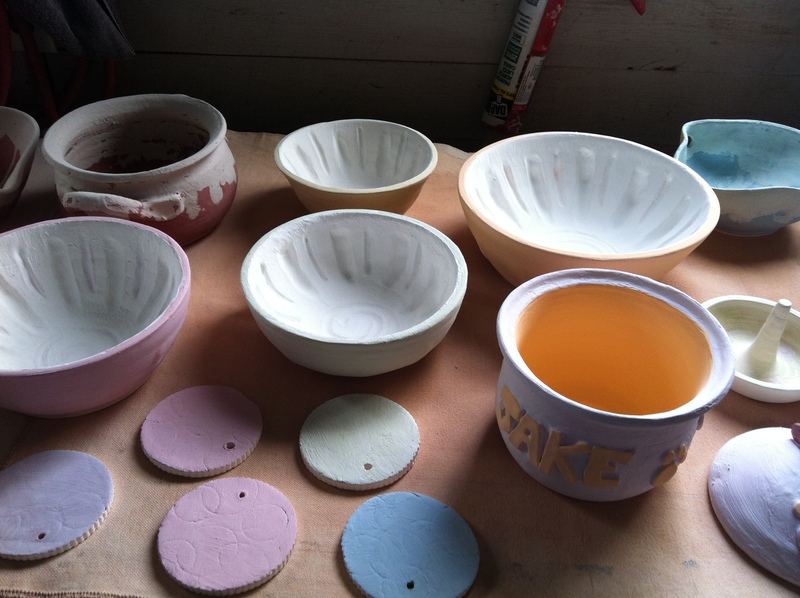 I’m going to glaze them each in different colors. 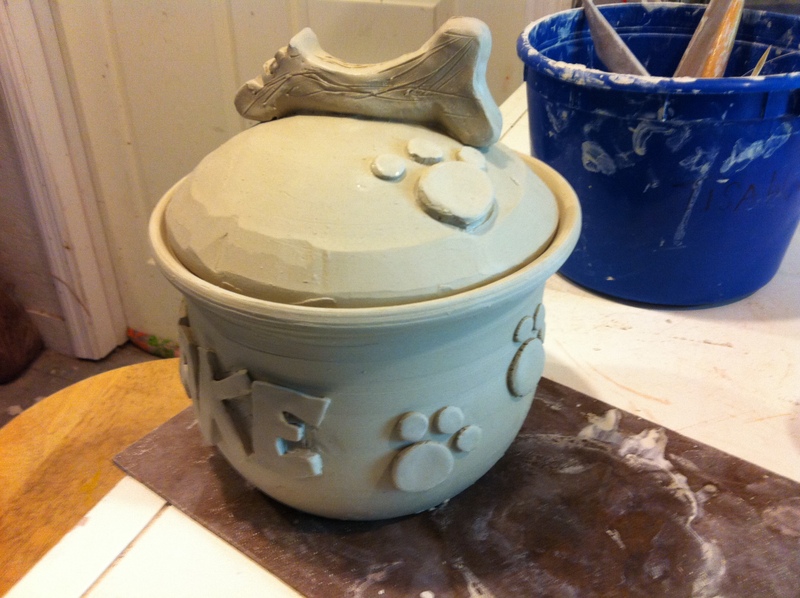 And a dog treat jar for my dear friends and their cutie pooch Jake. I hand-built the letters, paw prints, and munched treat handle. They’re huge Auburn fans so I suppose I will be glazing this in blue in orange. 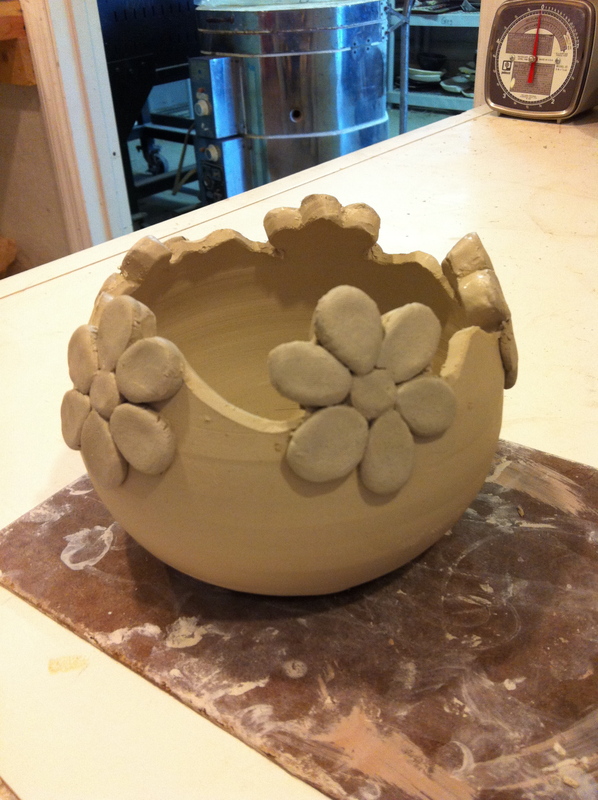 Aaaaand….. what came out of bisque fire this evening. 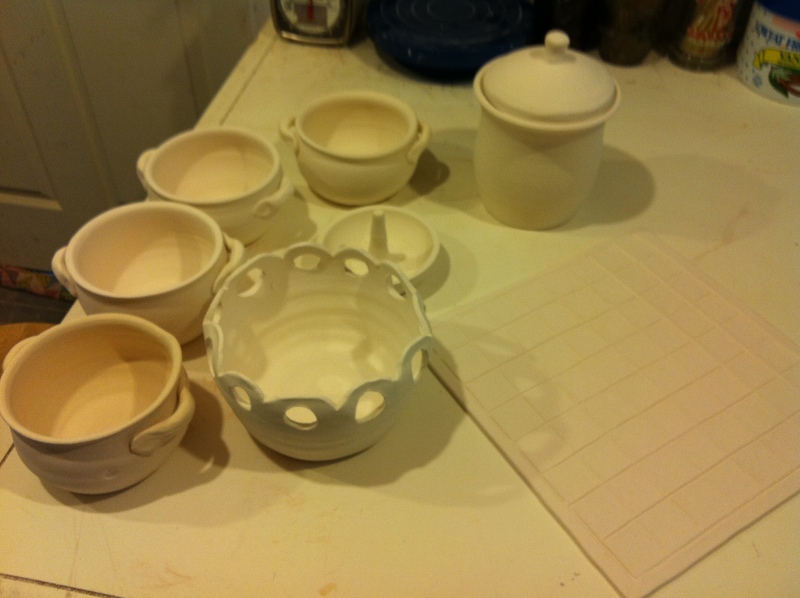 Soup bowls, ring holder with daisy design, lidded jar, chess board, and carved bowl. 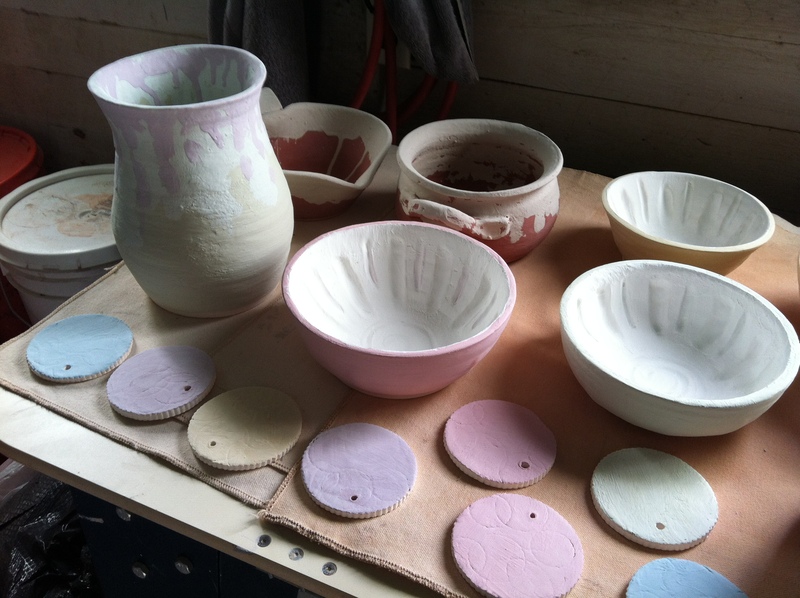 The beginning of the glaze process. 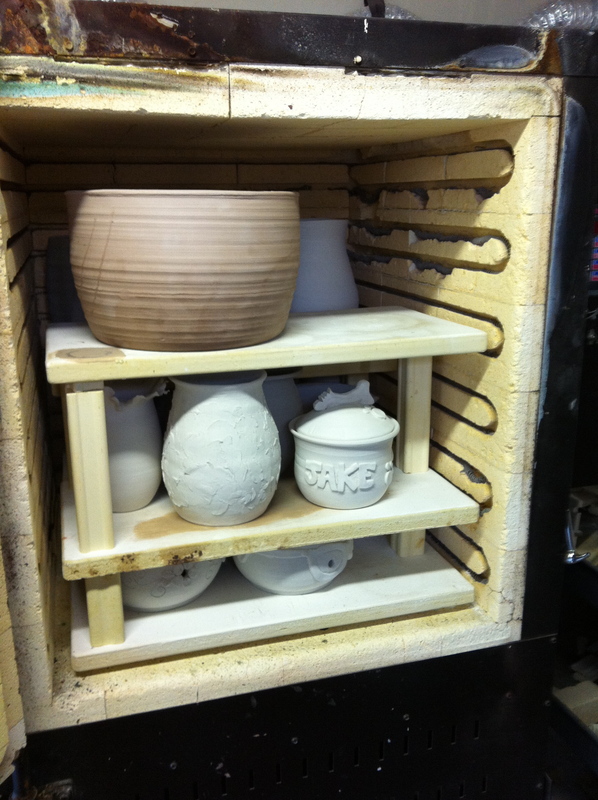 I patiently awaited the cooling of the kiln today. When I left last night it had been at 2,148 degrees and going up. I knew there were several of my things in it and it was the worst anticipation of loveliness. I learned, however, that a chipped piece of mounting will slice your finger quicker than it takes to produce a trivial saying. Students who take the candle making class will now be able to purchase these small glazed cylinders to pour their candles into. Candle class cylinder. I’m utterly in love with the mix of Apple Green and Robin’s Egg! The street festival was so very lovely. The weather was perfect and cool yet sunny. After my shift at the front I got to throw while it was going on and was given so many opportunities to talk and enjoy the day with strangers and friends. My favorite moment was when a little girl sat herself down next to me without preamble and asked me how old one had to be to be an artist. I replied that one is an artist at any age; whether it be baby or octogenarian. She stopped and pondered. I asked her if she liked to draw or paint and she said exclaimed, “Yes! I like to draw.” “You are an artist my dear,” I smiled. A young boy wanted to see me start again after catching me taking a piece off of the wheel. His parents and sister waited patiently while I talked through what I was doing. After I finished he said he wanted to do that. I told him that he should try but not be disheartened when if at first it doesn’t look too pretty…that it takes practice and persistence. His parents silently pumped their fists in the air and mouthed, “YES!” behind his back. I think I may have unintentionally reinforced a lesson they’ve been teaching. It made me smile profusely. While the wheel was spinning I would push on the clay to change its form and a child would say, “It’s magic!” or “coooooooool!” How can that not just tickle you? I hope I never become used to wonder and whimsy. I hope that I always giggle and dance and sing to myself.